Can you believe January has already gone! I have spent the whole month pottering around the house and garden squeezing in some excursions and weekends away, reading and sometimes just daydreaming ........which has been lovely in some ways and in others frustrating as I don't feel like I have got much done (procrastination). I have had the added cross to bear dealing with a man who works some of the time from home and insists on setting up office on the dining room table instead of the spare room called "the Office"! I have ummed and arhhhed about 2012 New Year's Resolutions but have come to the conclusion I should try and wipe procrastination from my vocabulary, hence I have put off my first post for the year until I completed the task set me by my sister who tagged me with Food Bloggers Unplugged! See her blog here http://lheureduthe-jennifer.blogspot.com.au/ So albeit very late - here I go - a little bit about me. My sister encouraged me to write a blog - she thought it would be fun. 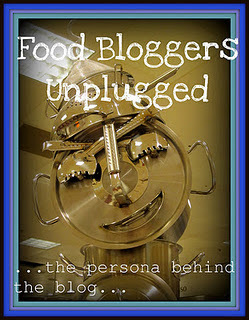 I had "run into" blogging and bloggers previously but had not taken it seriously until now. Now that I have started I am obsessive about it. I do love Nigella, but I also like Simon Hopkinson, Kylie Kwong, Maggie Beer, Donna Hay, Jamie for his push for healthy school dinners (I do have a lot of his books), and Stephanie Alexander for her Kitchen Garden project in schools, so no one person really. Your greatest, batter-splattered food/drink book is? Straight off the bat I have to say Kylie Kwong's Simple Chinese Cooking - the man is addicted to asian food so we have a "Kylie" dish more than once per week. Then I have to say Feast by Nigella Lawson. I love it because the recipes are for large numbers which I always seem to need. Tell us all about the best thing you have ever eaten in another courntry, where was it, what was it? Emmmm...... hard one this, there are just sooooo many lovely things. I do however, remember being on holiday in the Algarve in the late 1980's and ordering an entrée of sardines in a little Portuguese Seaside Restaurant. Previously I had only had sardines from a tin and never liked them very much, but these were so fresh and simply served - grilled with garlic and a squeeze of lemon - the fish itself being huge, the biggest I had ever seen and plump white flesh - I was completely surprised by them. Another food blogger's table you'd like to eat at is? My sister's table is always good but I would like to eat at James Ramsden's if I had half a chance. In December I went to a demonstration at a friends house for Thermomix - oooooh these look fantastic - I would love one. Well I think I am a person who learns by watching and I think I watched my mother a lot growing up and seemed to naturally be able to cook quite a lot of basic things probably by subliminal indoctrination. However, I think I taught myself to cook and I seem to be drawn to a wide variety of cookery books and cooking programs and dvds. So a combination of things really. I'm coming to you for dinner, what's your signature dish? Well if its a dinner party and I need to feed many mouths, I love to cook Nigella's Pumpkin and Fish Curry (not hot for non-spicy eaters) - it can be prepared ahead of time and just throw in the fish at the last minute or two - it always looks so colourful and impressive with little work! I love it. If its a casual gathering I love to make my homemade pasta and bolognaise. People are so impressed with homemade pasta but it is so easy. This was easy - I just can't go past a piece of fresh warm crusty bread with too much butter - I really have to stop myself eating more than one slice, in fact often I don't stop! I did have to think a little about this... but decided that bloggers may be surprised to know that back in 1987 when I was living in the UK Oxted Surrey I worked for a year or so as a cook in a local primary school. This was a time when all food was cooked on the premises and much attention was paid to fresh and nutritious - having said that when we did cook chips or donuts the line for "seconds" quickly appeared. Please don't procrastinate as long as I did - good luck and look forward to reading all about you ! Finally you have come out of hibernation! Jennifer - You need to google this product it replaces all the gadgets in your kitchen, it mixes, grinds, cooks all in one jug! Its about $2,000! Hence I didn't buy one. I put my order into Santa! Well done - looking forward to! Oh its lovely to learn more about you. And to learn that one of your signature dishes is homemade pasta. I am ashamed to admit that i have never made pasta from scratch, hope that changes later this year. Shaheen, Once you have made pasta yourself you will find it hard to go back to shop bought.